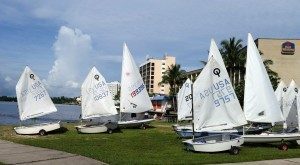 Located on the Caloosahatchee River in downtown Fort Myers, Florida, the Center teaches children the fundamentals of sailing. In addition to its fleets of International Dinghies, Optimist and Lasers, we also teach children (ages 10 and up) to safely operate motorboats. Group classes, adult instruction and private lessons are scheduled as registration warrants. For those who want to go beyond the basics, the Center has a year-round program that teaches all areas, with an emphasis on racing. Our sailors participate in regional, state, and national regattas. We also offer Level I USSA Instructor training for interested individuals. Edison Sailing Center was conceived in 1984 as a way to bring sailing to Southwest Florida’s young people. Using donated Optimist prams and lasers, the group (then operating under the name Royal Palm Sailing Club) started teaching sailing to kids during the summer months. Response to the program was so positive that classes continued throughout the year. The children not only wanted to sail, but they also wanted to race, giving birth to the Royal Palm Sailing Team. Our members have raced in many statewide regattas as well as national and even international events. In 1992 the city of Fort Myers leased the present downtown location. In keeping with the local theme, the new facility was named the Edison Sailing Center. Today, the sailing center maintains 250+ boats for instruction and racing. Sailing classes are taught in our Summer Sailing Programs. The beginning classes take the group from the basics – this is a sail – to being able to sail the boat by themselves. Intermediate and advanced classes continue to sharpen their skills and deepen their understanding of the effects of weather and an awareness of their environment. Each participant is assigned a boat and is responsible for rigging, sailing and unrigging that boat. Because the boats are bigger than the sailors, we apply teamwork and collaboration. One of the most important lessons we target is “Independence.” It is important to learn to be self-sufficient on the water. As the sailors learn to think situations through, they gain self-confidence. Each class is accompanied by U.S. Sailing Association certified instructors using powerboats to instruct and encourage the new sailors. The racing season runs from September thru May. During that time we travel to regattas all around Florida. We also host one of the largest regattas in the state in October. Qualified skippers are eligible to go on sailing/camping weekends which includes our annual July 4th trip to the Dry Tortugas.